All prices are with breakfast included. The Brian Boru Room is opulent and sophisticated, with views directly over the wild Atlantic waves. With a dark and tranquil colour scheme, a Scandinavian-style king size bed, the comfiest couch and a luxurious en-suite bathroom – you might not want to leave the room! The décor of the Surf’s Up Room mirrors the colours of the spectacular ocean waves, which the room overlooks. This is a spacious family room with two double beds, one single bed and an en-suite bathroom. The room also features a luxury sofa and cosy arm-chair – the perfect spot to enjoy a morning cup of coffee or and a read of the paper. The Golf Room is a comfortable, calm, inviting room, ideal for a a family getaway. This expansive room looks out over the lush greenery of Spanish Point Golf Course. 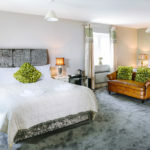 The Golf Room features two luxurious king size beds, a flatscreen TV, comfortable leather couches and an en-suite bathroom, which of course includes an array of our complimentary luxury bath products. 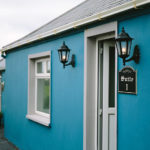 Perfect for relaxing after a day of exploring West Clare! 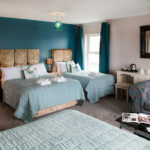 The Atlantic View Room oozes style and is perfect for a relaxing or romantic break! The room overlooks Spanish Point Beach. 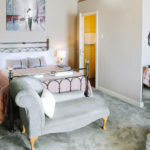 It features a ‘sink-into’ double bed, en-suite bathroom and plush seating area; perfect for an evening glass of wine watching the sun go down over the sea. Our self-catering apartments are perfect for families or groups. Apartment 1 features a large living/dining area with full kitchen facilities, an extra-large leather couch, flat screen TV and large dining table. 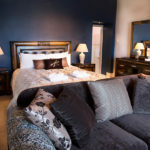 A separate bedroom features two doubles and one single bed, and a large en-suite bathroom. There is a picnic table right outside the apartment which can be used for al-fresco dining before or after a trip to Spanish Point Beach which is just yards away. © 2019 Coast Lodge. All Rights Reserved.